Center Wright Square Bisected by George Street - the northern half is currently occupied by the Glynn Junior High School. Halifax Square Bisected by Prince Street. In 1771 when Brunswick was planned, Governor Wright was still in residence in Savannah and superintended the survey. 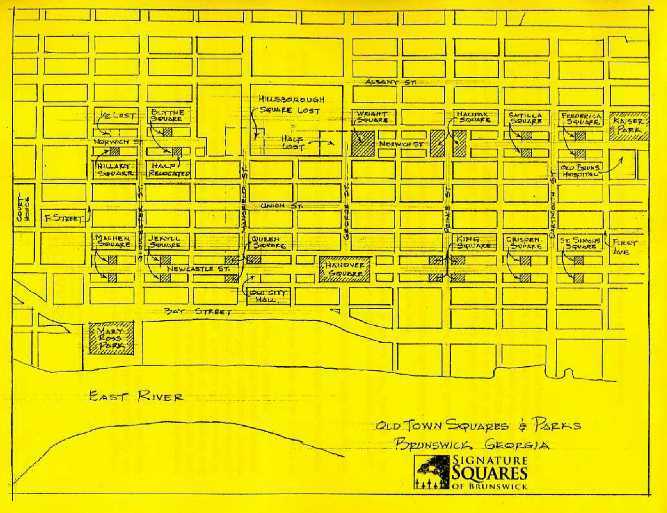 A number of squares were laid out and expected to be cultivated as parks, probably like the beautiful squares that still exist in Savannah. Unfortunately, the city fathers from time to time have seen fit to take over some of the squares for schools and public buildings and have bisected all except Hanover with streets. Between Egmont and Carpenter Streets seven parks were laid out, four small and three larger; between Grant and Richmond, seven others of comparable sizes were planned. Hillsborough Square, the present site of a complex of public schools, was named for the Earl of Hillsborough. He was President of the Board of Trade and Plantations, which had jurisdiction over all of the colonies. In 1768 he became Secretary of State for the Colonies and served in this capacity for some years, during which time Brunswick was planned. Hillsborough Square lies between Egmont and Carpenter Streets and is bisected by Mansfield Street. Additional land had to be purchased for some of the buildings there. The next large one in order is Wright Square, named for Sir James Wright, the last colonial governor of Georgia. Sir James was a native of South Carolina, the son of that state’s Chief Justice, and had been for twenty - one years its Attorney General. He succeeded Governor Ellis on October 13, 1760. He was descended from the Wrights of Norfolk County, England, and his grandfather, Sir Robert Wright, was Chief Justice of the Court of the King’s Bench in the time of James II. His grandmother was the daughter of Bishop Matthew Wren, a nephew of Christopher Wren. The new governor was qualified for his task by his long residence in Carolina and his experience in colonial affairs. His legal knowledge was a great advantage and aided him in the very satisfactory administration of the government. Sir James served from 1760 until the evacuation of Savannah at the close of the Revolution. Three years of this time he spent in Halifax, Canada, while the Revolutionists were temporarily in command of Savannah. Wright Square is bisected by George Street and the northern half is currently occupied by the Glynn Middle High School. The next large square between Egmont and Carpenter Streets is Halifax, named for the second Earl of Halifax, President of the Board of Trade from 1748 to 1765. He took an active interest in colonial development and made the Board of Trade a real department of the British Cabinet. He helped to found Halifax, Nova Scotia, which was named for him. In several ways he rendered good service to trade, especially with North America. He served in several different offices: Lord Lieutenant of Ireland, First Lord of the Admiralty, Secretary of Suite, Lord Privy Seal. He was an uncle of Lord North, the Revolutionary Prime Minister under George III. Lord Halifax had been a judge at one time in the criminal section of the courts. Possibly some readers may remember hearing their grandmother use the expression. "Oh, go to Halifax." It seems that Lord Halifax took it for granted that the prisoners were guilty until proved innocent, on the theory that if they were not guilty they wouldn’t be there. Hence, he judged them guilty and inquired into the matter afterwards. As a rule, the criminals got what was coming to them. When you wished to assign someone to proper punishment, you told him to "go to Halifax." This Square is bisected by Prince Street. The other three large squares lie between Richmond and Grant Streets. They have obvious names: King’s, which is bisected by Prince; Hanover at George, the only park left in original size; Queen’s, bisected by both Newcastle and Mansfield. One quarter of Queen’s was used for the old City Hall, currently it is used for public services. To one side of the building is a monument to Mark Carr, an original settler, to whom was granted for a plantation the land which Brunswick now occupies. 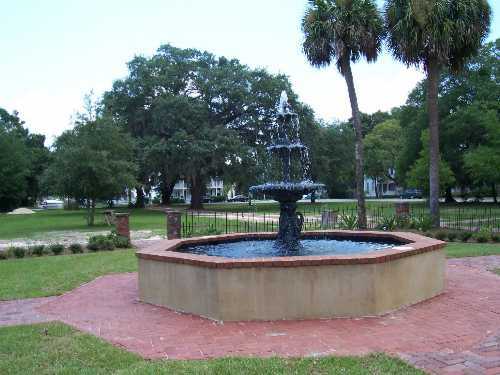 Three sections are left as small parks; one contains a monument to Oglethorpe, one a monument to Glynn County Men in World War II, and the third a monument to Major Columbus Downing, a prominent citizen and philanthropist.